At least 8,000 people will be sleeping out in Edinburgh on Saturday night as part of an event to highlight the problem of homelessness. Sleep in the Park also features a concert with headline acts including Liam Gallagher and Amy MacDonald. The Princes Street Gardens event has already raised more than £3m. Safety teams will monitor participants with temperatures set to be well below zero. Warm-up areas will also be set up to provide some relief from the cold. 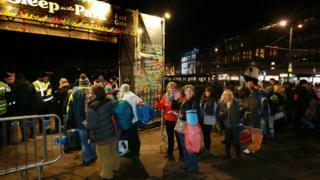 Organisers Social Bite said that as well as highlighting the ongoing problem of homelessness across the country, it would offer people a glimpse into the reality of sleeping rough. This is the second time the sleep out event has been staged - last time there were 200 people in St Andrew Square. Comedian Rob Brydon will host the event with John Cleese performing a bedtime story. Deacon Blue and Frightened Rabbit will also play unplugged. Celebrities including Bob Geldof, sports personalities and figures from across Scotland's political parties will also be sleeping out. It is being organised by Josh Littlejohn, co-founder of Social Bite, which helps the homeless through cafes, a restaurant and fundraising events. Efforts to eradicate rough sleeping were boosted on Friday with the announcement that about 475 new homes are being made available for homeless people. About 275 permanent housing association and council properties are to be provided in Edinburgh through the EdIndex Partnership. Wheatley Group, Scotland's largest housing and care group, has also committed to up to 200 homes for rough sleepers in Glasgow and the central belt.